Just got back from a 34 day training course to become an instructor with the NOLS. Here are some photos from the training which took place in the Gila Wilderness in New Mexico and Cochise Stronghold in Arizona. First order of business as a new instructor is teaching a hiking course in Alaska! Brian and I spent three weeks in Arizona shooting for NOLS at both Cochise Stronghold and the Santa Teresa mountains. Here are some stills from the trip. Stay tuned for upcoming releases on http://www.nols.tv to see the footage we shot. More photos from the mountains! May, June, and July have been some of the best months I can remember having lived, seriously. It started with a two week trip to Bolivia with Jason, Emily, Forrest & Dad where we visited several major cities and saw much of the Bolivian landscape. Then came a 30 day NOLS course focusing on mountaineering in the North Cascades and rock climbing in Squamish. 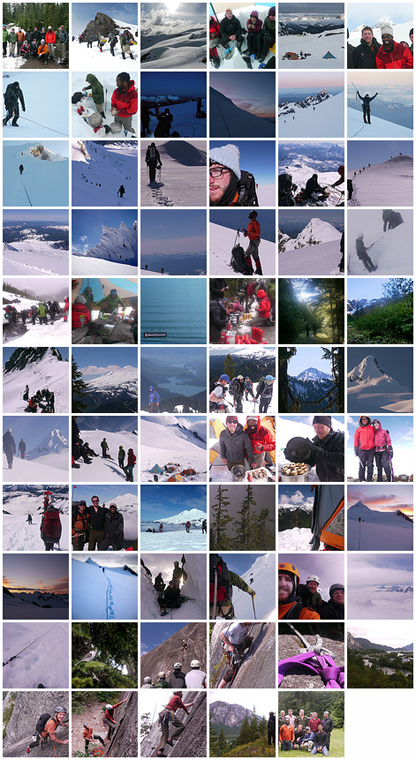 These spectacular outings were topped off by coming back to Lander for an awesome few weeks of climbing with friends. Check out a video I made about the Annual Climber’s Festival that took place in Lander a couple weeks ago. I’ve also been getting more excited about Flickr and have posted images from the NOLS course as well as the most recent climbing trip. Bolivia photos coming soon! I started working for NOLS last march as a video intern. Over the past few months my coworker, Brian, and I have enjoyed working for NOLS so much that we decided to try and create full-time positions for ourselves. As of last thursday we are full-time employees!! We created two ‘Video Producer’ positions and we have a one year contract to prove to NOLS that they should continue supporting a video department. Initial signs look good as video was a big topic of discussion during our annual ‘State of the School’ gathering which took place this last weekend and includes the NOLS board of trustees and all the various branch managers. If you haven’t seen them yet, some of our videos are at www.nols.tv which will be overhauled in the coming months. Unfortunately most of our latest work is not publicly viewable yet because we’re working on developing several series of videos before we release them. We’re also working on creating a stronger presence in the youtube community which fits into the NOLS word-of-mouth style marketing. First day as happy (and well dressed) employees. Brian took the wonderful image at the top of this post while the two of us were in Telluride for Mountainfilm. I did the photo-shopping. Had a couple exciting weekends in the mountains recently. This was my first view of the heart of the Wind River Mountain Range. Why was I in a helicopter you ask? I was asked to help out with a search and rescue mission for a climber stuck on Pingora peak in the Cirque of the Towers. So I got my gear together, put on a bright yellow shirt and a flight suit, and jumped into the chopper with my climbing partner Graham. Flying in you can see Pingora on the right. Graham looking cool in front of the helicopter at the landing zone. Turns out the injured woman (pink shirt & white helmet) was Kelsey Dayton a reporter from Jackson who was climbing with the aforementioned Joe Kelsey so as to write an article on him. I’ll let her finish up the story, read her article on the whole incident here. Suffice to say we got her out safely and flew out just as the sun was setting on the glorious granite of the Cirque. My second weekend in the winds was to go after a bit of a lofty goal: summit Gannet Peak with Graham (Wyoming’s highest @ 13,804) in two days rather than the 3-5 days most people say is necessary (oh yeah… it’s a 25 mile approach). Still in high spirits after the first five miles or so. Lot’s of interesting stream crossings. We ran into Andy Bassett in the middle of his NOLS instructor course. He was on day 28 or so in the backcountry and was definitely excited to see us. Hobbling out with hiking sticks. My knees felt like they were gonna explode at about 40 miles in, ugh. This is pretty much all we saw for the last couple hours as we hobbled back to the trail head in the dark. We finished our food, ran out of water a few miles back, and kept yelling “you go away bears” every now and then to keep our sanity. We finished car to car in just over 40 hours and were crippled most of the next week. Hmmmmm, maybe I’ll just stick to sports climbing. This old man asked me to take his photo, I obliged. Then he asked to take my photo. He gave me his hat and once again I obliged.